(Trent Nelson | The Salt Lake Tribune) Utah County Attorney David Leavitt in his Provo office on Thursday April 11, 2019. Leavitt is making some changes after winning his election. He plans to start a program to get low-level offenders into drug treatment or community service without ever filing criminal charges against them. And he'll start a conviction integrity unit — the second of its kind in Utah — that will look at the conduct of prosecutors and potential cases of wrongful conviction. (Trent Nelson | The Salt Lake Tribune) Utah County Attorney David Leavitt in his Provo office on Thursday April 11, 2019. Leavitt is making some changes after winning his election. He plans to start a program to get low-level offenders into drug treatment or community service without ever filing criminal charges against them. And he'll start a conviction integrity unit — the second of its kind in Utah — that will look at the conduct of prosecutors and potential cases of wrongful conviction. (Trent Nelson | The Salt Lake Tribune) Utah County Attorney David Leavitt in his Provo office on Thursday April 11, 2019. Leavitt is making some changes after winning his election. He plans to start a program to get low-level offenders into drug treatment or community service without ever filing criminal charges against them. And he'll start a conviction integrity unit — the second of its kind in Utah — that will look at the conduct of prosecutors and potential cases of wrongful conviction. (Trent Nelson | The Salt Lake Tribune) Utah County Attorney David Leavitt in his Provo office on Thursday April 11, 2019. Leavitt is making some changes after winning his election. He plans to start a program to get low-level offenders into drug treatment or community service without ever filing criminal charges against them. And he'll start a prosecutor review board to look into allegations of misconduct. (Trent Nelson | The Salt Lake Tribune) Utah County Attorney David Leavitt in his Provo office on Thursday April 11, 2019. Leavitt is making some changes after winning his election. He plans to start a program to get low-level offenders into drug treatment or community service without ever filing criminal charges against them. And he'll start a conviction integrity unit — the second of its kind in Utah — that will look at the conduct of prosecutors and potential cases of wrongful conviction. Provo • It’s been 15 years, but David Leavitt’s eyes still well with tears when he recounts sitting in a cramped holding cell listening to a man scream in anger, shrieks that eventually turned into sobs. Leavitt had just spent the past three weeks defending the man in a federal trial. A jury debated for 10 hours before convicting his client of a crime that would send him to prison for life. Almost two dozen of the man’s associates had cut deals to avoid harsh sentences. All were ready to testify against Leavitt’s client. But this man refused to take a plea deal. Instead, he exercised his right to a trial — and lost. As Leavitt sat in that cell listening to the sobs of a man who just found out he’d never be released, he had a realization. So after 15 years in criminal law, working as both a prosecutor and a defense attorney, Leavitt stepped away. He moved with his wife and six children to Ukraine, taking a job with the American Bar Association to help reform the criminal justice system there. He was happy splitting his time between Ukraine and Utah over the years, focusing his energies on teaching democracy and ethics overseas. Until a trip to Costco one summer day in 2017. He ran into a defense attorney who told him the Utah County Attorney’s Office had some big issues — and there was an election coming up. It got him thinking. This Utah gun lobbyist is the only man in America who can legally own a bump stock. He’s fighting in court to keep it — even though he thinks it is lame. So Leavitt, whose last prosecuting job was as the Juab County attorney almost two decades ago, entered the race — and won. 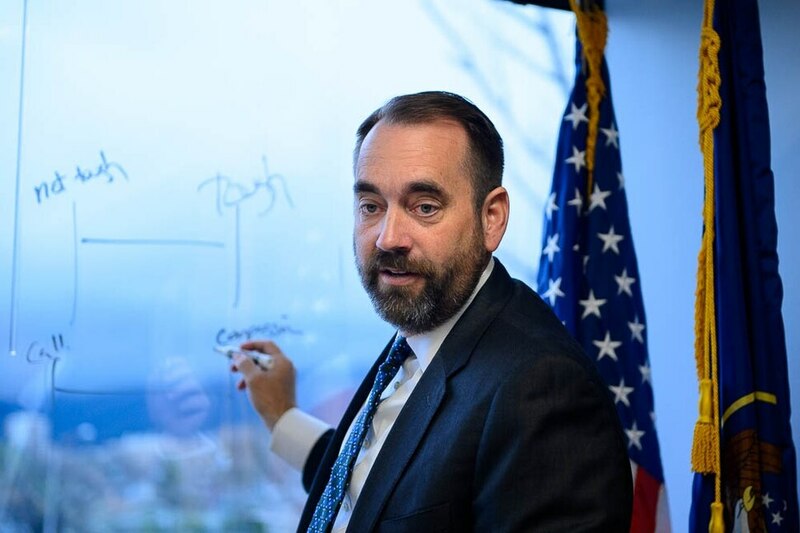 Now four months into the job, the 55-year-old Utah County man says he wants to bring criminal justice reform to Utah’s second largest county. That means big changes, including an idea more progressive than anything being undertaken in the state today. Leavitt’s first goal is to implement a program that keeps low-level offenders out of the courtroom altogether. No other county in Utah does it quite like this. His diversion program would kick in before criminal charges are even filed, allowing certain people who have committed minor crimes to complete community service, life classes or drug treatment. If the participants are successful, the case goes away and nothing is ever on their permanent record. Leavitt said that most low-level offenders today are receiving little punishment and few treatment options after their cases languish for months. But those defendants often get trapped in the system — either by violating their probation, or having trouble getting a job or housing because of their criminal record. By offering them an alternative in the beginning, he hopes more people will get treatment or learn the skills they need to turn their lives around. But if the participants are unsuccessful, criminal charges are filed and their cases would be prosecuted as normal. There will be limits. People accused of drug distribution, child abuse, sexual assault, murder or other violent crimes would not be eligible. And it’s not really intended for those who want to argue that they are innocent, Leavitt said. It’s targeted for people who are being arrested for crimes like simple drug possession — and in Utah County, there’s a lot of those. Leavitt said that last year, his office filed around 5,000 cases. A third were for possessing small amounts of drugs. There already are drug court programs set up to help those people, but there are few slots available. Leavitt calculated that it’s statistically more probable for an applicant to be admitted into Harvard University than it is for an arrested person to get into 4th District drug court. The diversion program is one way Leavitt says he’s trying to fix what he believes is a broken system. The upcoming change in how his office handles low-level crimes, he said, also illustrates the “enormous power” that prosecutors have in society, something that he’s not all that comfortable with. The diversion program is radical, particularly for the Utah County Attorney’s Office. Leavitt knows he’s asking prosecutors to shift their traditional thinking. But this is a project he’s dedicated to and he will fill his office with prosecutors who also buy in. The county attorney said no one has embraced this idea more than the man who ran against him during last year’s election — Chad Grunander, deputy Utah County attorney. Grunander is now heading up the diversion program, another new challenge for someone who describes himself as more a “traditional rule of law” prosecutor. He had his reservations, Grunander admits, but he’s now excited to give it a try and see if it works. This isn’t the only new program Leavitt has in the works. 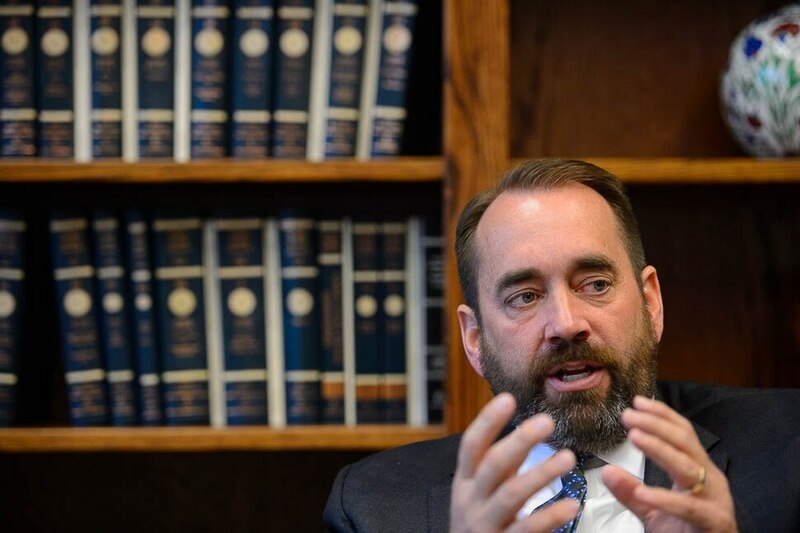 For the past few years, the most vocal complaints about the Utah County Attorney’s Office came from a small group who said prosecutors had damaged the lives of people who were falsely accused of crimes. 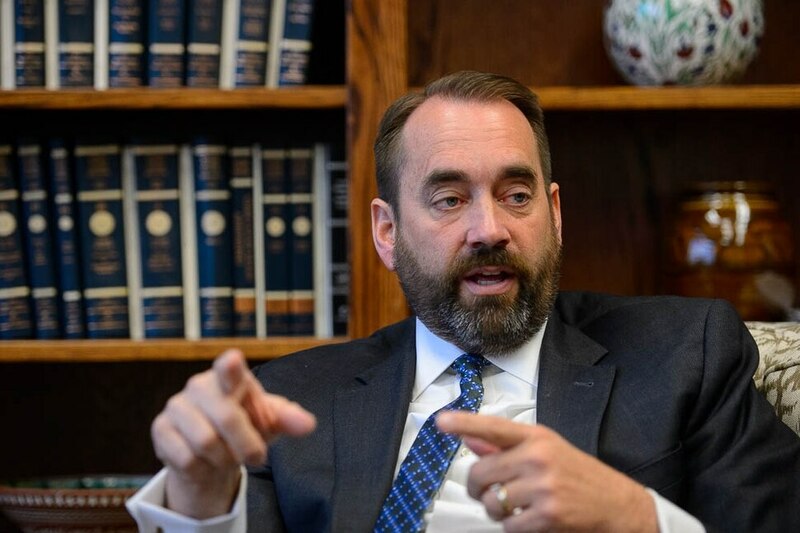 They pointed to a string of high-profile prosecutions that ended in acquittals or dismissed charges, and asked the Utah County Commission to take an unprecedented step of forming an outside commission that would have oversight over the county attorney’s office. The proposal drew pushback from then-Utah County Attorney Jeff Buhman, who argued there was already enough oversight in place. Buhman said there were mistakes made by his prosecutors, but they never amounted to misconduct. The County Commission was posed to create the review board in February, but hit pause indefinitely after police and prosecutors raised objections. So what will the new county attorney do about this issue? Leavitt said he plans to form a conviction integrity unit, a group of retired prosecutors, defense attorneys and judges who can go over cases where someone’s innocence is in question. It would be the second oversight board in Utah. The first was created last October by the Salt Lake County District Attorney’s Office, and it will look at the conduct of prosecutors and potential cases of wrongful conviction. If there is evidence that a person is innocent, Leavitt said he could go to court and ask for the conviction be thrown out. When asked whether prosecutors could be disciplined if the unit finds misconduct, Leavitt said it would be handled on a case-by-case basis. Libertas Institute President Connor Boyack, whose organization was among those that petitioned for a prosecutor review board, said he would watch how Leavitt’s conviction integrity unit works. He said his group, a libertarian think tank, believes it’s always better for a review board to be completely independent, but the success of similar programs usually hinges on who is in charge. Boyack said he’s encouraged by Leavitt’s pre-filing diversion program and plans for reform. Leavitt said his goal is not rooted in the success or failure of a certain program or review board. He hopes to bring change not only in his own office — but to help his community realize that the us-versus-them mentality of labeling people as criminals has been harmful and overly punitive.